It’s been well over a month since my last post. I haven’t had much crocheting and knitting time over the past few weeks, but I have been plugging away, working on several of my unfinished projects. I’ve completed several more sock yarn squares and I’ve also made quite a bit of progress on the malabrigo lace shawl (remember that?). I’ve seen many more beautiful versions of Eva’s shawl of the past few weeks. My current favourites are those in self striping yarn (particularly this one by mettetation). 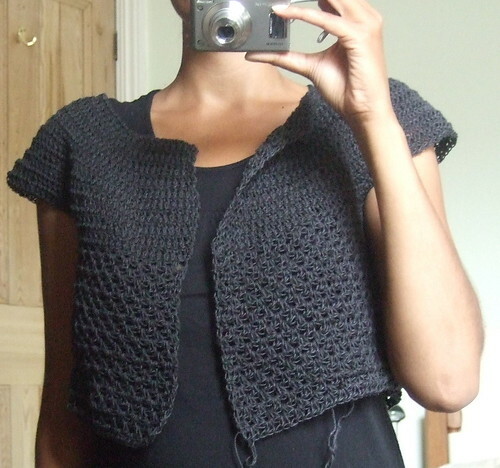 I’ve just tracked your blog down from thefabledneedle and love it!!! Would you be so kind as to submit yourself to a wee interviewette some time??? I do occasional interviews with designers and it’s a great way of spreading the word. Hi, I love this sweater even though you have not finished it. Will there be a simple patter available? I have tried top down crochet before but it didn’t come out right.